The key issue here is not so much that Jesus washes the feet of others, and that we must imitate this inspiring act. Rather, it is to allow Jesus to wash our feet. Gritting our teeth to do some dirty chores in order to build character is easy; allowing ourselves to be vulnerable and be served can be much more difficult. This was so even with the apostles, as Peter essentially flipped out when Jesus wanted to wash his feet. Peter did not think that he was worthy enough. He did not want to expose his insecurities and vulnerabilities to the Lord. We are the same as Peter. We do not wish to face the Lord in our insecurities and vulnerabilities. We have judged ourselves before the Lord has even said a word. This is the true tragedy of our time: we are not allowed to appear vulnerable in front of others. Even the best of us feel insecure and vulnerable in one way or another. This is the same when it comes to our relationship with the Lord. Many of us waste our time to appear perfect in front of the Lord, and subsequently fail to establish a personal and trusting relationship with our Saviour. This can happen both in prayer and in situations where we encounter the least of our brethren, the ones out of whom Christ promises to show his face. In truth, neither Peter nor we are worthy of God’s ministrations from an objective viewpoint, and on our own we would never be truly ready to approach the Lord. But our worthiness does not rest on personal merits, but rather comes from the unconditional love of God; despite our imperfections and faults, we are accepted and loved. This is the foundation of the washing of others' feet. It is not up to us; it is up to God to show us this. We cannot give what we do not have. If we have not experienced this boundless mercy of God, we will not have the gratitude or magnanimity to give ourselves to others. More importantly, if we refuse to personally accept the unconditional love of God, we simply cannot freely give ourselves to love and service. We need to stop judging the filthiness of our feet and allow Jesus to wash them, or else we would never get over the filthiness of the feet of others. 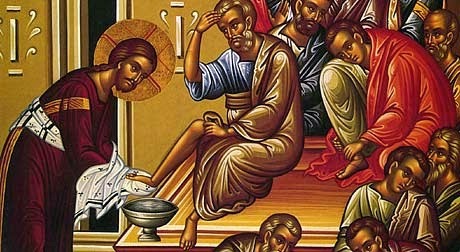 Therefore, let this upcoming Maundy Thursday be a point of reflection for us: how much am I allowing the Lord to wash my feet?